North Devon has a wonderful coastline, it's worth just going for a drive for the views. 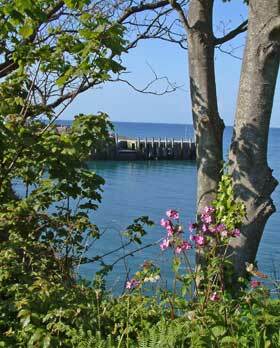 You will pass by sandy coves, dramatic cliffs, small villages, hedgerows teeming with wild flowers and birds. There is a good number of blue flag beaches in both north and south Devon should you wish to go for a day trip. Blue flag beaches are recognised for the quality of the bathing water and cleanliness. It also means that dogs are generally banned or restricted. There is a number of blue flag beaches in Devon. Croyde - wide and deep sandy bay, perfect for all beach activities plus surfing. The village of Croyde has charming thatched houses and a thatched pub as well as several surf schools and shops. A regular stream of surfers plays on Croyde and other north Devon beaches. Lynmouth - cliff walks with great views, harbour. On the edge of Exmoor. Westward Ho! - a great name for a 2 mile length of sandy beach and rock pools in north Devon close to the Tarka Trail and South West Coastal Path. The beach is backed by Pebble Ridge and a country park and golf course. Woolacombe - gentle shelving sandy beach backed by rolling hills down to the sea. Good for surfing.